The “Learning 3E for Injury Prevention” shows what is prevention and then explains the 3E (Enforcement, Environment and Education) by each item that is an important factor to approach injury prevention. It provides the basic knowledge that enables schools to plan safety activity at school or to carry out a specific measurement. 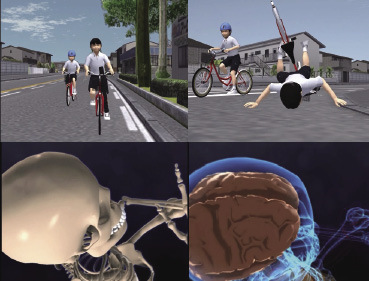 The learning material for an elementary school student has three types, “Learning Risks inside School”, “Learning Risks at Schoolyard” and “Learning Bicycle Safety”. Classes for “Leaning Risks inside School” take up the four themes, accident caused by mischief, falling down, getting a finger caught and bumps, meanwhile you can add or modify themes depending on the school’s needs. 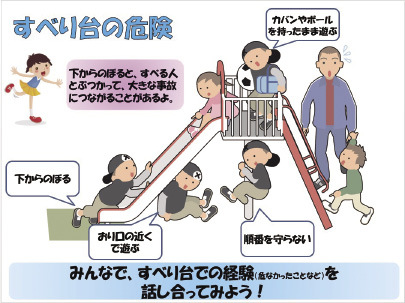 “Learning Risks at Schoolyard” focuses on accidents with playground equipments such as the horizontal bar, swing, slide, overhead ladder and jungle gym. 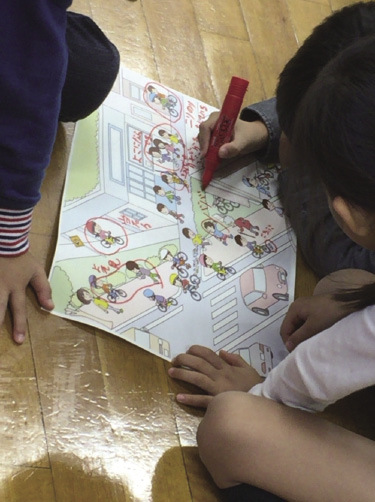 After the introduction of accident cases per theme of learning materials, there are demonstrations with movies and illustrations about how accidents happen and what kind of play causes accidents. “Learning Bicycle Safety” points out the importance of wearing a helmet and bicycle maintenance. The effect of wearing a helmet will be shown in the simulation movie. In addition, explanations are based on data. For example, if the width of brake does not fit with the hand size, it will delay about 0.1 second to work brakes. 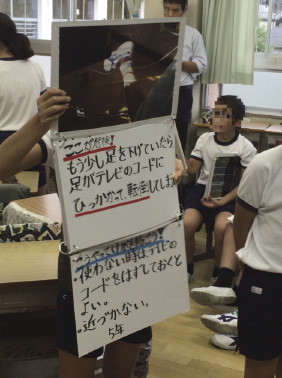 Junior high school students’ material is “Learning Risks in Sports”. Using the data of accidents in sports reported by Japan Sport Council, a case of accidents resulting in fatal or serious injury and an occurrence status of the accident depending on sports are described in illustration. here is also a guidance of how to use AED and heatstroke counter-measurement. Safety Learning Education Program can be used as part of class such as health and physical education, life environment studies, home economics and homeroom activities along with the school’s curriculum guidelines. The result of aggregation and accident examples gained through the injury surveillance can be put into an learning material to create the adoptive material to each school. 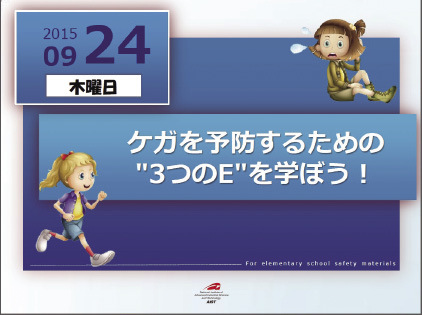 It is expected to motivate children to attend a safety activity. We are intend to increase the content of the program. These days, “injury prevention” becomes a class unit and the number of schools that tries to get certified as an international safe school is increasing. This accompanies the requirement that the school implement injury prevention based on data, but it is still quite difficult to actually commence. National Institute of Advanced Industry Science and Technology (AIST) has already proved the occurrence mechanism of accident and established the method to scientifically prevent accident. We thought that we want to cooperate with schools and promote the activity for injury prevention education based on data. Thus we invented the Safety Learning Education Program. All schools, having done safety leaning class, conducted the effect evaluation for each class. 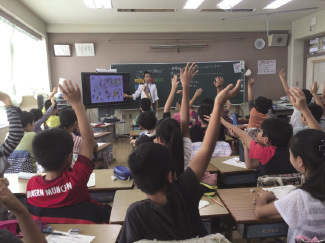 At the class of “Learning Risks at Schoolyard” for the 3 years-grade students of Tokyo City Taito Ward Kinryu Elementary School, there was the same question before and after the class, which was “Do you think there is something you can do to prevent an accident?”. The number of students who answered “Yes” increased from 50 percent before the class to 89 percent afterwards. Suggested examples of what they can do are “Do not play with a ball near the swing”, “Do not play with equipment when holding something” and “Wait for your turn”. In the same way, in the class “Learning Risks inside School” for the 6 years-grade students, the answer “Yes, there is something I can do” before and after the class increased from 30 percent to 70 percent, respectively. Suggested examples are “Do not close the door suddenly”, “Stop temporarily to avoid bumping into someone” and so on. Thus, the effect of safety learning class was verified. Learning Bicycle Safety” was conducted at Nagasaki Prefecture Omura City Omura Elementary School. The number of students who answered “Always wearing a helmet” increased from 56.5 percent before the class to 65.5 percent afterwards. Thus, we determine students’ awareness of injury prevention and effect on behavior modification so that we can make use of it for improvement to build the better content. In response to the request from a school, we organize the combined injury prevention curriculum of several learning materials. At Tokyo City Toshima Ward Fujimidai Elementary School, we conducted the safety class project for the 5 years-grade students by making the curriculum combining “3E learning as the base of injury prevention”, “Learning Risks inside School”, “Learning Risks at Schoolyard”, “workshop to record safety and risk inside the school by pictures” and “presentation of the pictures”.